In 1997, Nike commenced production of its own line of skate shoes, but was unable to sell to many specialist skate shops, as the market was already strongly in favour of companies such as DC, Globe, eS Footwear, Emerica, and Vans. Created from recycled materials, the Nike SB Courthouse Black/Black/White Backpack has a design that’s built to last and is easy to access. Velcro straps hold your skateboard securely in place, a large zippered main compartment provides ample storage for your gear. The streamlined construction features dual side pockets as well as a small-item pocket in the front for storing quick-access essentials like your phone and wallet. This bag is made to last. A water-resistant bottom helps keep your gear dry while densely woven polyester creates a durable material. Nike consistently makes high quality gear, and the Courthouse backpack is no exception. A simple streamlined design, easy access pockets and durable construction make this pack great for skaters and commuters alike. Created from recycled materials, the Nike SB Courthouse Iguana/Black/White Backpack has a design that’s built to last and is easy to access. Velcro straps hold your skateboard securely in place, a large zippered main compartment provides ample storage for your gear. The streamlined construction features dual side pockets as well as a small-item pocket in the front for storing quick-access essentials like your phone and wallet. The Nike SB Icon Black Crew combines the casual comfort of a crew-neck, pullover sweatshirt with the soft feeling of brushed fleece. Ribbing at the cuff and waistband for a snug fit. Pullover design offers easy on and off. Nike SB logo is embroidered on the left chest. The Nike SB Icon Red Crush/Black/White Backpack features a spacious main compartment ideal for carrying your gear from school to the park. This backpack has anatomically designed straps, bulit to provide comfort while you’re on the move. Nike SB Icon PO Black/White Hoodie combines the casual comfort of a hooded, pullover sweatshirt with the soft feeling of brushed fleece. Looks great and is perfect for everyday wear. Nike SB Icon PO Medium Olive Ornamental/Pink Hoodie combines the casual comfort of a hooded, pullover sweatshirt with the soft feeling of brushed fleece. Looks great and is perfect for everyday wear. The Nike SB Icon Storm Pink Backpack features a spacious main compartment ideal for carrying your gear from school to the park. This backpack has anatomically designed straps, bulit to provide comfort while you’re on the move. Nike SB Zoom Stefan Janoski Canvas Deconstructed Men’s Skateboarding Shoe has a low-profile silhouette that delivers breathability, grip and responsive cushioning without sacrificing board feel. Deconstructed canvas upper offers a lightweight feel. Traditional autoclave construction fuses the outsole to the upper for a streamlined look and a low-to-the-ground fit. Tri-colored rubber delivers a pop of color with every push. The Nike SB Stefan Janoski Max Shoes are the most comfortable shoe to wear if your on your feet all day! Nike Stefan Janoski Skateboarding Shoe has a clean look and a simple design, with a sturdy upper for durability and a rubber outsole for flexibility and boardfeel. 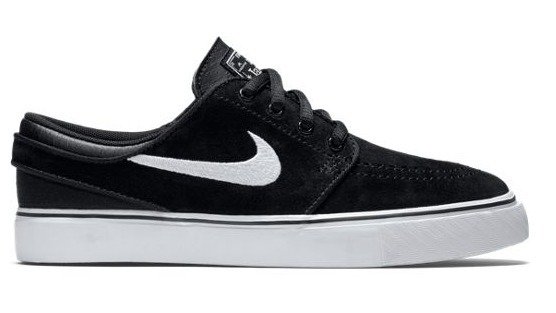 The Nike SB Stefan Janoski Vast Grey Phantom/Bubblegum-White Shoes have a low-profile silhouette. This shoe has durability, grip and responsive cushioning, without sacrificing board feel! Nike SB Zoom Blazer Low Black-White Shoes pair a locked-in fit with lightweight, responsive Zoom Air cushioning. Its low-profile design takes cues from ’70’s heritage footwear while providing flexibility and traction for great board feel. Low-profile suede upper, leather and nubuck materials. Leather Laces (With regular laces in the box).